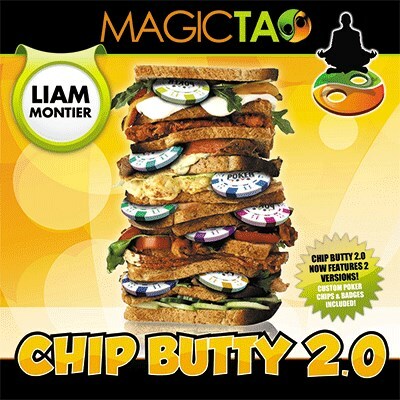 Chip Butty' is a brilliant NEW routine from Liam Montier. It combines several existing and commercial ideas into one compact, killer routine! 'Chip Butty V2.0' includes both the original poker chip version and the NEW badge version. A card is chosen by a Spectator and replaced in the centre of the deck. The deck is then shown on all sides. Four badges are shown to the Spectator. Each badge has a different card suit printed on it. You remove three of the badges in a 'process of elimination'; none of the three badges match the selected suit of the chosen card.The fourth badge completely vanishes! You lift half the deck and there's the fourth badge - ATTACHED to the Spectator's selected card! 'CHIP BUTTY' includes the custom printed pin badges for the badge version, custom poker chips for the poker chip version, special Bicycle brand playing cards and full instructions.If you would like to have the card signed, as in the trailer, and hand the badge out as a souvenir you will need to purchase refills. Details of how to do this are described on the DVD.